Kybella is a breakthrough double chin fat removal treatment now offered by Dr. Thomas W. Loeb in his New York City plastic surgery office. If you are bothered by under chin fullness but aren’t ready to go under the knife, Kybella injections are an effective and affordable non-surgical option. This non-invasive procedure has shown significant results in eliminating moderate to severe submental fat in just a few short months, and is a great alternative to a neck lift and liposuction. Kybella is the first and only FDA-approved cosmetic injectable that improves the appearance of fat and fullness below the chin. 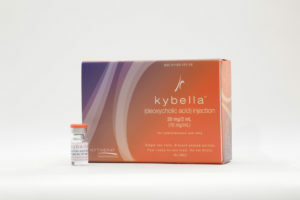 Composed of deoxycholic acid, a naturally occurring molecule in the body, Kybella works by destroying fat cells responsible for double chins. This revolutionary treatment mimics your body’s natural fat-absorption process, giving a sleek profile and jawline that’s sculpted and youthful. A topical numbing cream is applied beneath the chin prior to the treatment. Kybella is then injected with a micro-thin needle into targeted areas where fat cells have accumulated. Most patients will need between 20 and 40 injections per session and up to four Kybella treatments to realize optimal results and under chin definition. This in-office procedure takes less than 30 minutes, and has no downtime or recovery period. The most common side effects are localized swelling and minor bruising that can last 3-4 days. Some patients will achieve desired results after two Kybella sessions, while others may want additional injections for a tighter jawline. Improvements will be noticed over the following four to six weeks as the fat cells are eliminated by the body. Once satisfied with your jawline and under chin appearance, you won’t need re-treatment because the fat has been permanently dissolved and will never return. In clinical trials and modern practice, Kybella has been proven to deliver noticeable improvement in the reduction of a double chin. Individual results will depend on the amount of submental fat at the beginning of the treatment. Dr. Loeb typically spaces Kybella sessions 4-6 weeks apart, customizing the treatment plan for the best aesthetic outcome. Men and women who are predisposed to having extra fullness under the chin report a more contoured jawline, a slimmer facial appearance and a facial profile they are proud to show off within a couple of months of their Kybella treatment. The price of Kybella varies from patient to patient, depending on how many injections and sessions they need to achieve their goals. The cost for a single Kybella treatment is in line with other cosmetic injectables used to restore facial volume. Keep in mind that Kybella in NYC is less expensive than a neck lift or under-chin liposuction (and also carries less risk of complications), and the final results are permanent. In order to fully assess your options and Kybella costs, it’s best to consult with a board-certified plastic surgeon. Be wary of getting any sort of cosmetic injectable at reduced cost, as the providers will not have the same level of education, training or expertise. The majority of people with under chin fullness are bothered with this area of their body, which can make them look heavier or older than they actually are. If you’re ready to say goodbye to the dreaded double chin without surgery or downtime, Kybella delivers truly amazing results. To find out if you’re a candidate for Kybella, Manhattan plastic surgeon Dr. Loeb offers private consultations in his Fifth Avenue suite. Schedule your appointment by calling 212-327-3700 or submitting the online form.